Today’s choice of wallpaper will come as no surprise to anyone (except perhaps my colleagues at the university, who don’t seem to care how I spent my Thanksgiving). I love this photo for its symmetry—the United Launch Alliance Atlas V rocket with the Mars Science Laboratory hovers above the launch pad, perfectly aligned with the towers of its lightning protection. 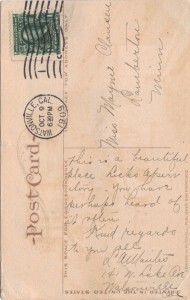 You can download the full size of this photo by clicking on the image above. It is also available in 1600×1200, 1024×768, and 800×600 formats in the NASA Image of the Day Gallery (currently image 4, but the gallery changes by the day, so you might have to click through a few photos to find it). As I’m sure anyone with any interest in the subject has heard by now, NASA celebrated a successful launch of the Mars Science Laboratory (Curiosity rover) Saturday at 10:02:00.211 a.m. EST. I was fortunate enough to be able to attend the launch, as well as several pre-launch presentations/Q&As and gatherings, as part of a NASA Tweetup. I haven’t sorted through all my photos, much less all my thoughts, but as my mind and life return to normal, I’ll be taking using this website to store some of my impressions of the experience. I’ll have more to say about the Tweetup later, but let me start with the topic of the Kennedy Space Center Visitors Complex (KSCVC). I took two different tours of the KSCVC—the first, the standard bus tour that comes with the price of admission, the second, a more extended tour with the NASA Tweetup group that included part of the Cape Canaveral Air Force Station. My lingering impression is this: Kennedy Space Center, along with the rest of the NASA-affiliated sections of the space program, is trying to work through a rather ambiguous moment in space history. The Space Shuttle program is over; Constellation was cancelled; the U.S. National Space Policy is in its infancy; current launches (like the Mars Science Laboratory or the upcoming Space X launch) are all unmanned; the launches are taking place on the Air Force Station rather than Kennedy Space Center… Perhaps because of these factors, my tour guides were having difficulty locating the ever-shifting line between past, present and future. I think people are still in denial, or even shock, that the end of the Shuttle program is actually here. That end came so recently (the final Space Shuttle mission, STS-135, was in July 2011) it’s easy to forget that another mission isn’t just around the corner. But I think real cause of the slippage is that there isn’t a clear path forward from here in terms of manned missions. 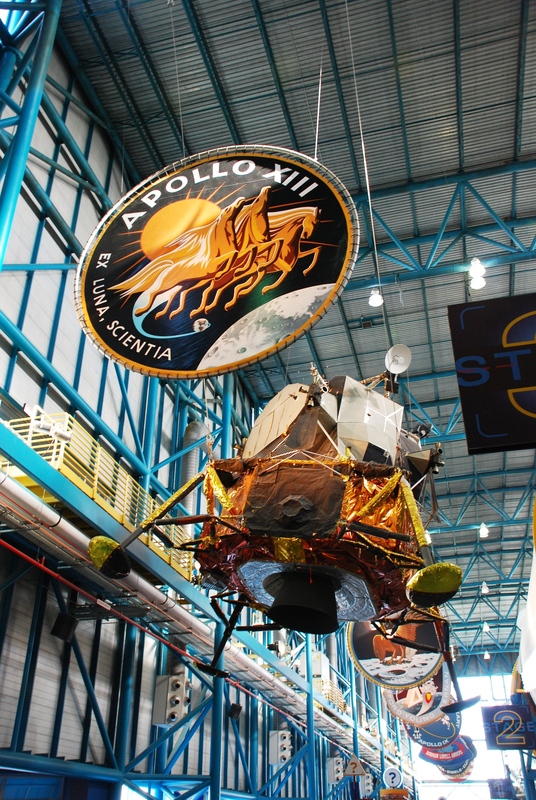 While NASA is involved in many different space exploration initiatives, Kennedy Space Center derives a large part of its identity from manned launches. 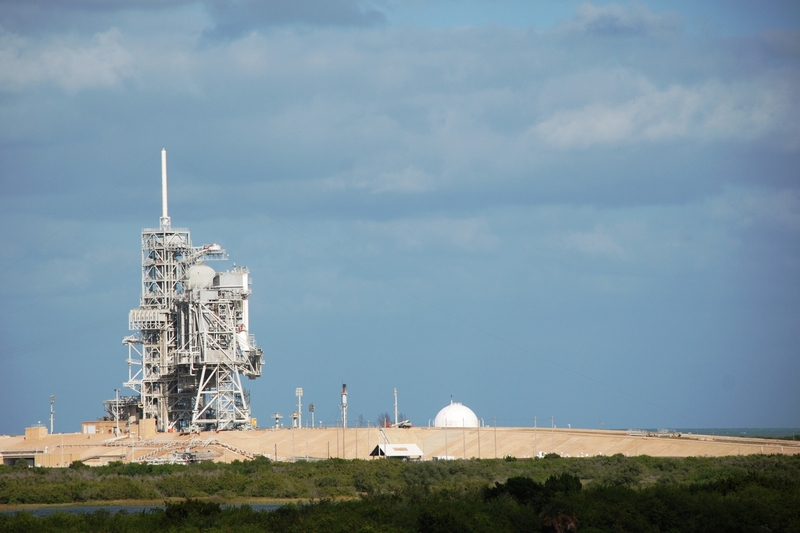 The photo above shows LC-39A, the last launch pad to be used for the Space Shuttle program. So far, it’s been left intact. I heard various explanations for this decision, some of which emphasized practicality (“We don’t know what we’ll need in future, so it doesn’t make sense to take it down if we might have to put it all back up again”), some of which highlighted something closer to nostalgia (“It’s symbolic, to remind us and visitors of what we accomplished with the Shuttle”). The truth probably falls somewhere in between—NASA can’t spare the money to break down what doesn’t need to be broken, so what’s the harm is letting it do some emotional work for us? There’s a certain longing for manned space flight among NASA and its supporters. So many of the presentations I heard during the Tweetup framed the Mars Science Laboratory in terms of future manned exploration, as if that is the natural procession of science, and the only reason to fly unmanned missions (first we do a fly-by, then we do an orbit insertion, then we land a rover, then we manage a sample return, and then we send humans!). I’ll have more to say about that later. For now, I’ll just leave it at: I wonder what is lost/gained when we approach missions as part of a chain that culminates in human travel? How would the discussion change if we considered unmanned exploration as an end instead of a means? Today’s wallpaper image is probably an obvious choice. We arrived in Florida yesterday for the Mars Science Laboratory launch, still scheduled for this Saturday. We spent today sorting out our credentials (two separate trips to Kennedy Space Center Visitor Complex) and walking on the beach (two separate trips to Cocoa Beach). Tomorrow, we’re going back to KSCVC for the day (lunch with an astronaut, ice skating in the Rocket Garden?). 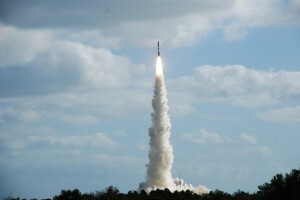 Official NASATweetup events start at Kennedy Space Center Friday morning and run until 6:00 in the evening. There’s a lot on the agenda, including a tour of the Vehicle Assembly Building, so hopefully I’ll have some up-close-and-personal photos on my flickr site next week. 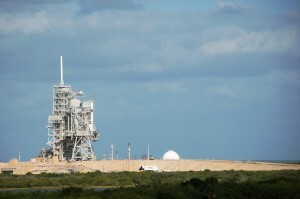 If the launch goes as scheduled, I’ll be arriving at the NASATweetup viewing area sometime before 6:45 a.m. Wish me luck with that. This seems like a good time to make a confession: I don’t actually care about Curiosity’s official mission. The search for environments capable of sustaining life—in the past or future—isn’t what drives my interest in planetary exploration. 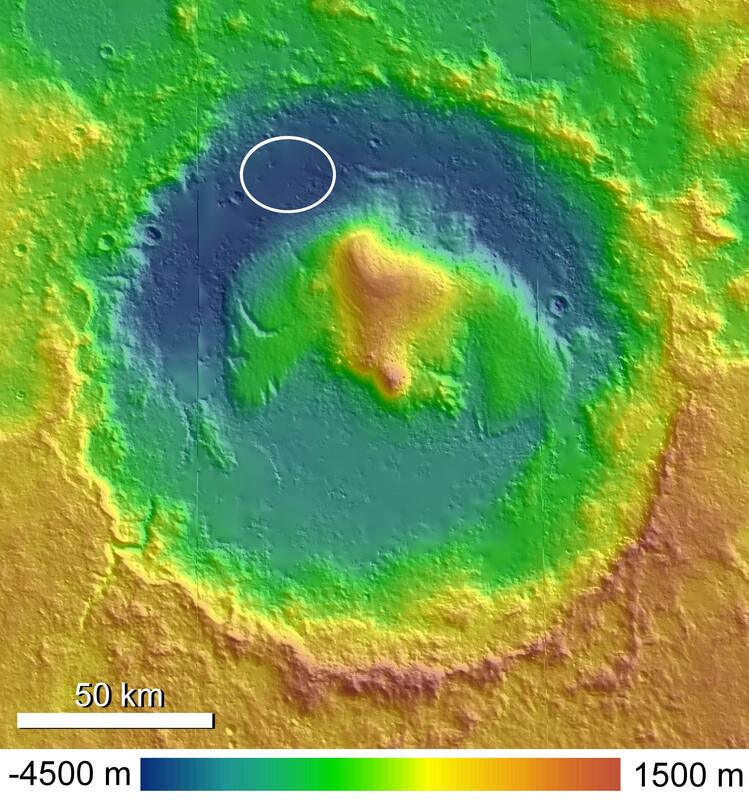 I’m much more intrigued by the details of geological processes: what are the specificities of volcanic activity on Mars? How has Mars’ environment changed the nature of sedimentary rock formation? It would be interesting if there was (carbon based?) life on Mars at some point in the past, but “is there life out there?” doesn’t even make my top one hundred list of Questions To Which I Want To Know The Answer. 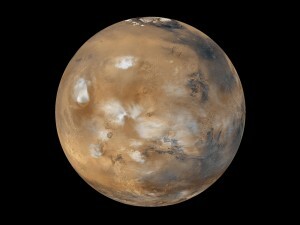 Click on the linked image to download the photo of Mars. It’s not quite wallpaper proportions, but if you fill in the rest of your desktop with a solid black background, it will look sweet! As an aside, every time I look at this image, I remember the night I made the mistake of studying Mars through our Meade DS-10 telescope. The retinal burn was tremendous; I saw an after-image of the planet with the polar ice cap for days afterward. Sedimentary Debris, Gale Crater. Image Credit: NASA/JPL/Arizona State University, R. Luk. Today’s image shows the mound of debris layered across the floor of Mars’ Gale Crater. This debris mound, which ranges in height from 2.8 to 3.4 miles above the floor of the crater, surrounds a central peak, visible in the back left of the image. Scientists posit that the layers of sedimentary rock could function as an archive of 2 billion years of geological activity on the planet. It will be up to Curiosity, the new Mars Science Laboratory rover, to explore this mound of sedimentary deposits and report back on the constituent elements of each layer. I’m starting to ramp up for the NASA Tweetup next week. My initial burst of excitement about the Tweetup drowned in the subsequent flood of information related to the event—transportation and lodging options, meals before, during and after the Tweetup and launch, T-shirt designs (multiple), pin and patch designs, press releases, social media introductions, etc. Add to that the details of arranging travel to Florida, finding a housesitter, working through some personal stuff (see a couple posts back), planning ahead so I wouldn’t be swamped at work when I returned from the trip, and all I really wanted to do was take a nice, long nap, not to wake up before the New Year. But that stage is over. My partner, who isn’t part of the official tweetup, landed her Rocket Launch Transportation Ticket (excuse me, RLTT) today, and that was the last stressful detail I needed to work out between now and our departure. We have a sixteen hour drive from home to Florida, so we’ll be entertaining ourselves with choice passages from the Mars Science Laboratory Launch Press Kit. Also, we’ll be playing Slug Bug. 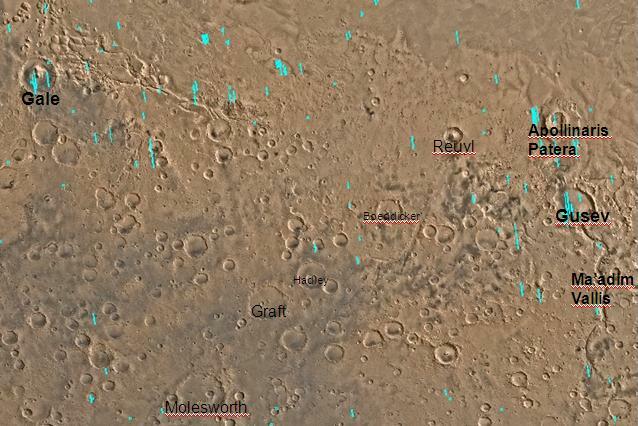 In the meantime, I’ve been studying topographic maps of Mars. Curiosity, the Mars Science Laboratory rover, is projected to land near the edge of Elysium Planitia in the Aeolis quadrangle. If the name of the quadrangle sounds familiar, that’s because the Spirit rover landed there in 2004. 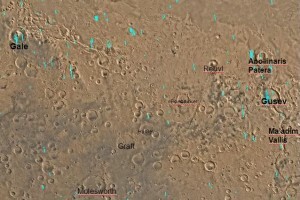 However, Spirit explored Gusev Crater (at the right in the above image), while Curiosity is bound for Gale Crater (at the left). Spirit’s mission centered mostly around the search for water activity on Mars. Although Curiosity will also be seeking water, the mission as a whole is broader then previous ones, in that the rover will be seeking water as evidence of past or present habitable environments on the planet. It’s not seeking signs of life, per se, but rather trying to determine if and when conditions in Gale Crater might have been capable of supporting life. The presence of water would be a particularly strong piece of evidence, but it would be even better if it coincided with a possible energy source or other chemical ingredients considered necessary for the creation/sustenance of life. As the #MSL #NASATweetup draws nearer, I’ll be posting more information about Curiosity’s mission. I’ll do my best to post regular updates, if not about MSL itself, then about the wicked fun we’re bound to have during our trip. Oh, and “Lunch with an Astronaut” on Thanksgiving Day. You can bet I’ll be telling you all about that. NASA Twitter Followers Will Tweet from Kennedy Space Center, Fla.
Urbana, Illinois (November 9, 2011) – NASA will bring together 150 Twitter followers to NASA’s Kennedy Space Center for a two-day Tweetup, November 23 and 25, 2011. 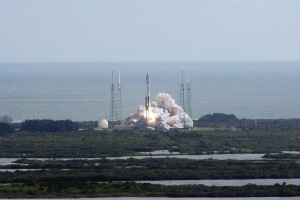 The Tweetup is expected to culminate in the launch of the Mars Science Laboratory Curiosity rover aboard a United Launch Alliance Atlas V 541 from Cape Canaveral Air Force Station in Florida. Urbana, Illinois resident Susan Johnson-Roehr has been selected as one of 150 @NASA Twitter followers to attend and Tweet the event. Curiosity is anticipated to arrive at the Red Planet’s Gale crater in August 2012. 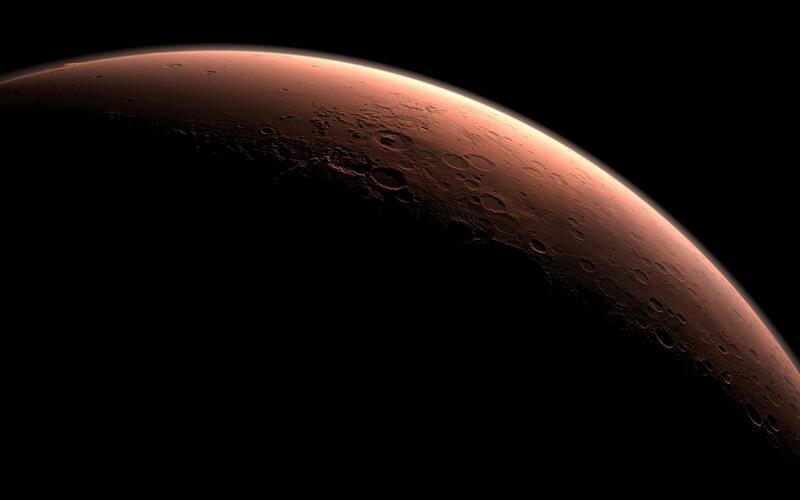 During the two-year mission, the rover will investigate whether a selected area of Mars offered environmental conditions favorable for microbial life and will preserve evidence about life if it existed. As a NASA Tweetup attendee, Johnson-Roehr and the other 149 Twitter users will interact with engineers and scientists as well as tour the Kennedy Space Center. If all goes as scheduled, participants will view the spacecraft launch. In addition, participants will meet other tweeps and members of NASA’s social media team. Attendees were selected through a lottery system in which more than 1,050 @NASA Twitter followers registered. Susan Johnson-Roehr is a Visiting Lecturer in the School of Architecture at University of Illinois, where she specializes in the history of astronomy and architecture. Follow her Tweets at twitter.com/big_valley. NASA held its first Tweetup on Jan. 21, 2009, at the Jet Propulsion Laboratory in Pasadena, Calif. NASA’s Tweetup Twitter account is http://twitter.com/NASATweetup and participants will be using #NASATweetup in their updates while tweeting. Information about NASA Tweetup can be viewed on http://www.nasa.gov/tweetup . Managed by NASA’s Jet Propulsion Laboratory in Pasadena, Calif., Mars Science Laboratory is the fourth space mission launching this year. Aquarius, launched June 10 to study ocean salinity, was the first; Juno, launched Aug. 5 to study the origins and interior of Jupiter; and the twin GRAIL orbiters, which departed for the moon on Sept. 10. The MLS Curiosity rover is equipped with 10 science instruments and will search Mars for evidence it has had environments favorable for microbial life. The rover will use a laser to look inside rocks and release the gasses so that its spectrometer can analyze and send the data back to Earth. Launch management for the mission is the responsibility of NASA’s Launch Services Program at Kennedy Space Center in Florida. 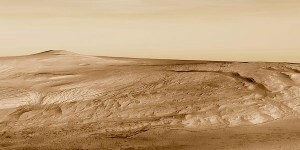 Find additional information about the Mars Science Laboratory mission, visit: http://www.nasa.gov/msl and http://mars.jpl.nasa.gov/msl. Today’s wallpaper features McCormick Observatory, located on Mt. Jefferson on the campus of the University of Virginia. The observatory is named after Leander J. McCormick, donor of the 26-inch astrometric refractor still housed under the dome of the building. 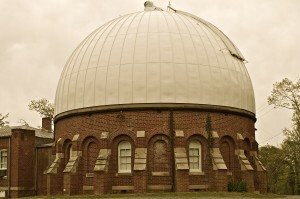 Usually we see the names Warner & Swasey associated with the instruments (they designed the telescopes for the Kirkwood, Lick, University of Illinois, Theodor Jacobsen, and Yerkes Observatories, amongst others), but at University of Virginia, they were charged with the design of the original observatory dome, a first for the duo. The dome was manually operated, but the track system provided for such an ease of motion that Warner & Swasey immediately applied for a patent for their design. 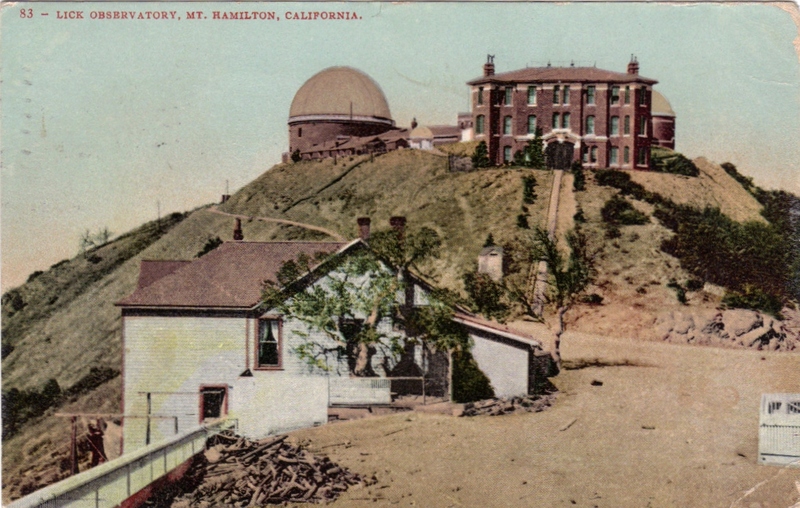 Construction work began in 1882; the observatory was formally dedicated on April 13, 1885. In addition to the dome room, the original building included a wing that housed the calculating rooms and a bedroom. If you looked at the image above and thought that the building’s detailing looked more suited to a cathedral than an observatory, you would be right: the Medieval Renaissance windows and buttresses echo a similar motif used (more appropriately) on the University chapel. The director’s house (now known as Alden House, or Observatory House #1) was also built in 1882, with additional funds supplied by McCormick. To download wallpaper (standard sizes) of the above image, click here. Paul B. Barringer, James M. Garnett, and Rosewell Page, Eds., University of Virginia: Its History, Influence, Equipment and Characteristics (New York: Lewis Publishing Company, 1904): 9. After searching the patent registry, I can only guess that they were trying to protect their design for the process of cutting teeth of gear wheels, Patent No. 333, 488. Richard Guy Wilson and Sarah A. Butler, University of Virginia: The Campus Guide (Princeton: Princeton Architectural Press, 1999): 144. Click on the images for high-resolution scans. 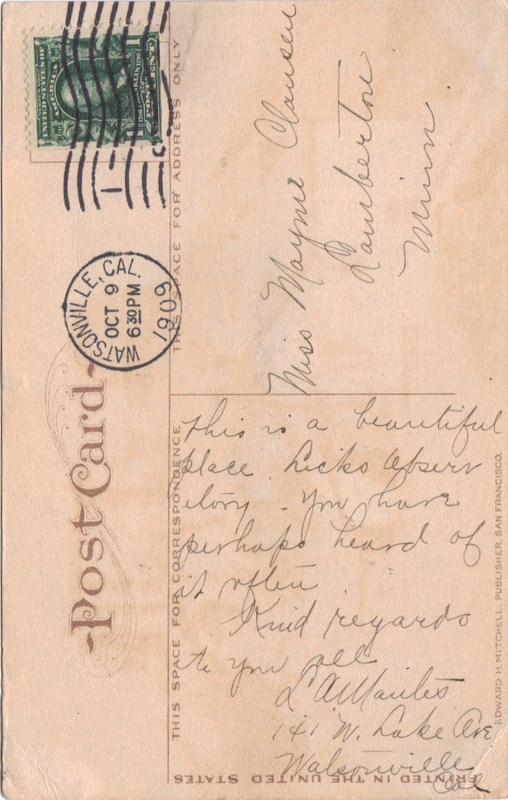 For earlier posts detailing Lick Observatory, see here. Today’s image is dedicated to Bob Rood, my favorite astronomer and father of my closest friend. There are many things I could tell the world about Bob—about the entire Snell-Rood clan—but selfishly, I’d like to keep my thoughts and feelings to myself right now. 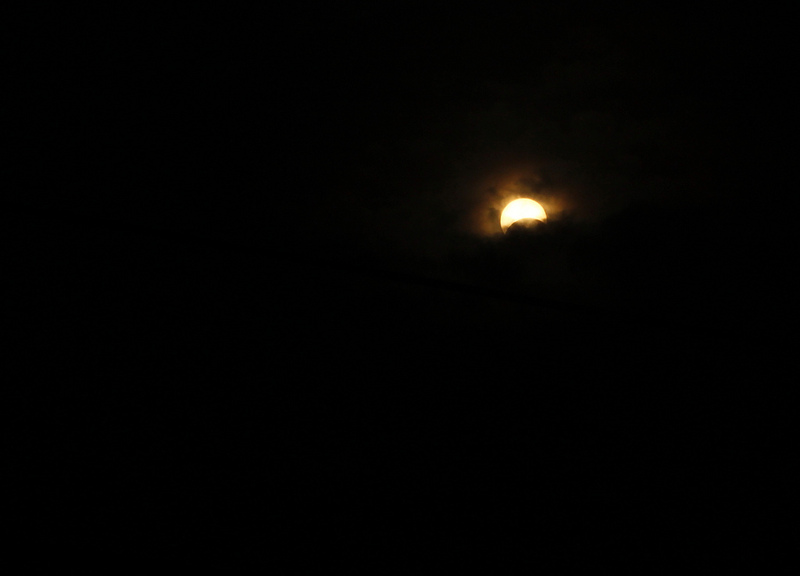 Instead, I link you to his narrative of the trip we took to Varanasi to view the total solar eclipse in 2009. I think you’ll be able to tell from his story and photos why that week meant so much to me.